The American Revolution is one of the most studied time periods in U.S. history and a substantial part of the history curriculum in schools. 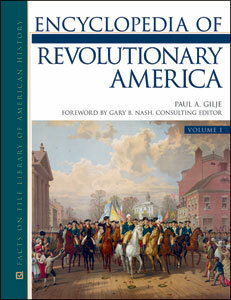 The three-volume Encyclopedia of Revolutionary America is the definitive reference to everything students need to know about this pivotal moment in American history. Written by a preeminent scholar in the field, with a foreword by the esteemed Gary B. Nash, this comprehensive A-to-Z encyclopedia not only includes discussion of the continental U.S., but contains coverage of the Atlantic world and the North American continent as well. Black-and-white illustrations, an index, and appendixes round out the insightful resource. "...an easy-to-use, helpful, and comprehensive resource that would be a valuable addition to the history collections of high-school, academic, and public libraries." "...a good addition to school and college libraries...a complete, exhaustive collection..."